The Ecological Engineering Society Rain Garden is the second rain garden established at Chadwick Arboretum. Our first rain garden was located at our maintenance site (beside the "barn" at Arboretum North). This garden was removed when the barn was scheduled for demolition in 2009. In spring of that year, the Ecological Engineering Society installed a 300-square-foot rain garden in our Lane Avenue gardens along the walk entry on the eastern side of the Agriculture Engineering Building. Additional funding support was provided by the Native Plant Society of Columbus for purchasing plants and supplies. This garden effectively mitigates the rain water runoff from the sidewalks and steep slopes along the Olentangy Corridor of our gardens. An additional rain garden was installed at the enCore Solar Decathlon House in Fall 2014. This site is located in Arboretum North. The Central Ohio Rain Garden Initiative (CORGI) is a collaborative effort to promote the benefits of rain gardens for community beautification and clean water. CORGI can provide education and technical assistance to help with rain garden assessment, design, and planting plans. Assistance is available for residents, community organizations, municipalities, and businesses. For more information about CORGI or about establishing a rain garden at your location, visit the Central Ohio Rain Garden Initiative web site. In coordination with Linda Johnson of Scioto Gardens Nursery and Gallery, Stephanie Suter of Franklin Soil and Water Conservation District, and Jonathan Meier of Rain Brothers, Chadwick Arboretum offered a Rain Garden Workshop a few years ago, and continues to promote rain gardens and the use of rain barrels in the home landscape. Scioto Gardens continues to support our rain garden efforts through plant donations and education. 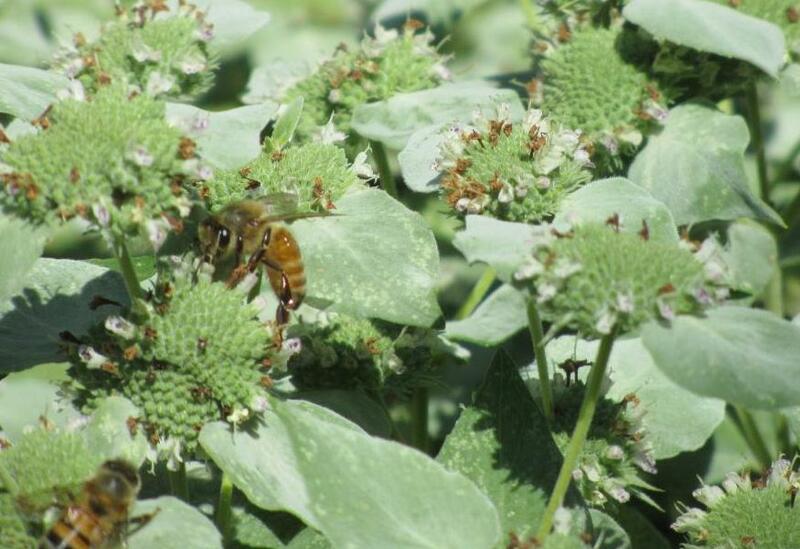 One of the favorites in the rain garden is the short-toothed mountain mint, a clump-forming aromatic perennial that typically grows 1–3 feet tall. Nicely aromatic, this native likes to be planted along the wood's edge. 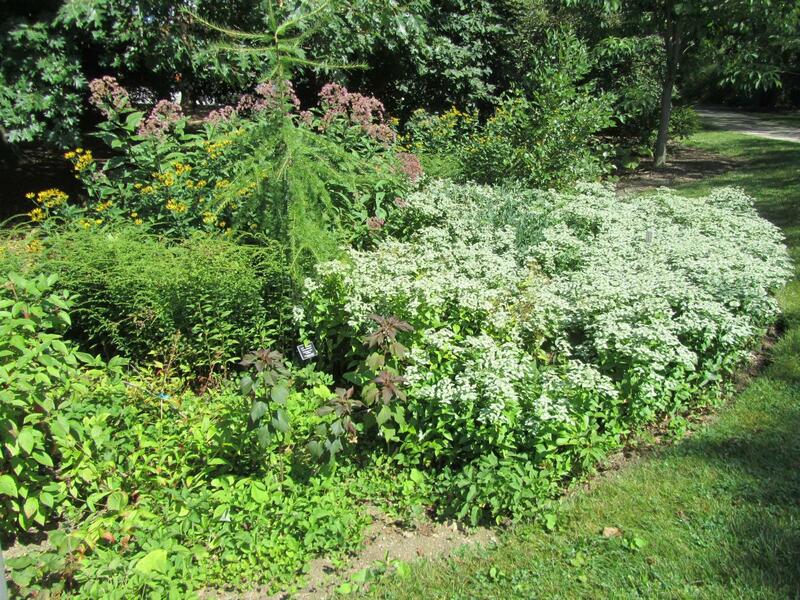 It is excellent for a naturalized border or woodland garden. 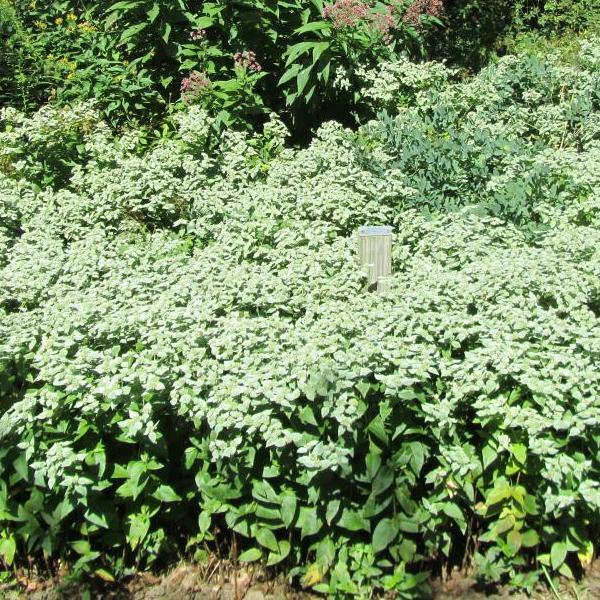 When planted in groups or massed, the silvery bracts give the entire planting the appearance of being dusted by a white powdery snow. Flowers are attractive to butterflies and bees.